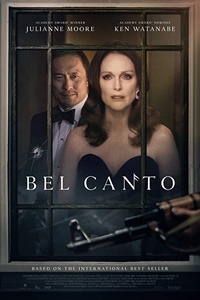 Roxane Coss (Moore), a famous American soprano, travels to South America to give a private concert at the birthday party of rich Japanese industrialist Katsumi Hosokawa (Watanable). Just as a handsome gathering of local dignitaries convenes at Vice-President Ruben Ochoa's mansion, including French Ambassador Thibault and his wife, Hosokawa's faithful translator Gen, and Russian trade delegate Fyorodov, the house is taken over by guerrillas demanding the release of their imprisoned comrades. Their only contact with the outside world is through Red Cross negotiator Messner (Koch).